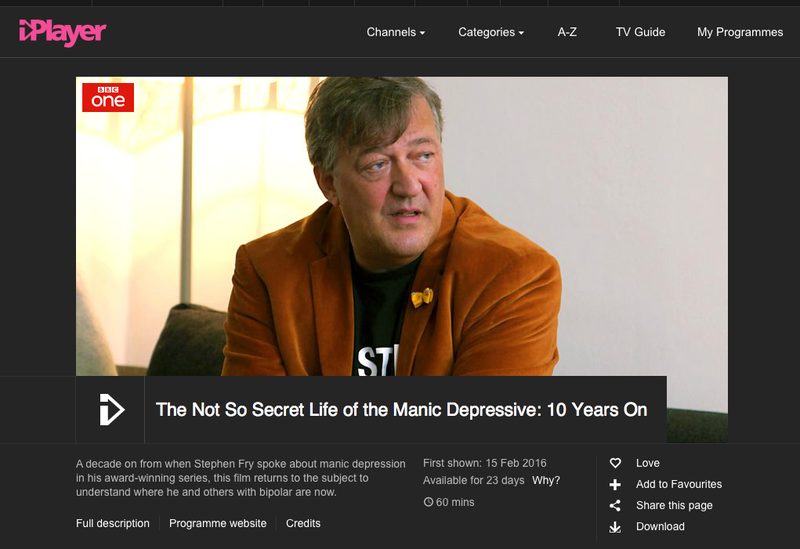 Kate Johnstone reviews 'The not so secret life of the manic depressive', part of the BBC's 'In the Mind' series. The BBC are to be commended for their two-week strand of mental health programming, In the Mind. Its stated intention is to ‘help raise public awareness and understanding of issues relating to mental health’. It is therefore unfortunate that the opening programme, ‘The Not So Secret Life of the Manic Depressive: Ten Years On’ was a curate’s egg which has attracted attention for the wrong reasons. We were first reminded of Cordelia, who had featured ten years ago and had been diagnosed at the age of 22. The question posed was, is early diagnosis beneficial? In short shrift, the answer in this case was ‘no’. Cordelia had apparently not improved at all since then. She was in a depressive state, living a very restricted life. However, we were given no sense of what treatment or clinical support she’d had in the intervening years. Worse, she’d been diagnosed two years ago with breast cancer. After a hospital scan, she flatly announced her terminal illness to camera, her stunned mother beside her. Yet it was unclear whether this was her diagnosis, or her depressed state talking (although who might not be depressed in her position?). In either case, it felt voyeuristic, and told us little about either the understanding of bipolar disorder or its treatment. The programme became further confused when it featured Alika, a young man who had experienced online bullying. A stranger filmed a manic episode Alika had had on the tube: Alika was singing along, loudly and not especially tunefully, to the music in his headphones. The clip had gone viral, and inevitably, amongst the thousands of comments, were many vicious and offensive ones. But from what we were shown, these were about his singing, along the lines of ‘who does he think he is’. Whilst Alika clearly felt the comments reflected on his manic state, objectively they didn’t seem to be about his mental health. As an illustration of whether it is easier for young people to say they have bipolar disorder, therefore, it was either poorly chosen or badly explained. We did briefly see an interesting discussion between Alika and a group of teenagers about how young people perceive mental illness; this was surely one aspect which the programme should have devoted more time to. Segments which featured Stephen himself were not much better, with a tonal inconsistency that detracted from the subject matter. At one point, Stephen and his psychiatrist discussed Stephen’s recent state of mind, and Stephen described a recently schedule which involved a flight from London to LA (where he spent a day), then immediately back to London, then straight onto India. An animated graphic and jaunty music popped up to illustrate each leg of this ill-advised journey. What a lark! Except his psychiatrist was pointing out the need for reduced stress, regular sleep and exercise, and to avoid situations and behaviour which might act as triggers. The programme did make some more coherent points, especially when showing a married man who worked as a chef. His ordinariness was refreshing, and his challenges seemed likely to be more relevant: how do I hold down a job? How does my condition affect my family? The programme also tried to finish on a more positive note by featuring Rachel, a young woman who (despite becoming paralysed during a psychotic episode) seemed to be living well with a bipolar disorder diagnosis. Overall, this was a frustrating watch on its own terms. It did not directly answer any of the three questions it posed itself, in particular, the crucial ones about understanding and treating bipolar disorder. This failure makes it less surprising that there has been significant criticism of the programme for talking a purely biomedical approach, which it seemed to do by default. Viewers were surely left none the wiser about the range of support and treatments that must be out there; why many resist being medicalised (as Stephen himself had in the original documentary); nor why some manage their condition better than others. - Reviewed by Kate Johnstone, Associate Editor for 'Reviews'. The Not So Secret Life of the Manic Depressive: first broadcast on BBC1 on 15 February 2016 and available for 25 days on the BBC iPlayer. See also our reviews of 'My Baby, Psychosis and Me', 'Life After Suicide', and 'Suicide and Me', all in the 'In the Mind' series.